Many Prestige recordings were recorded by Rudy Van Gelder at his own studios, on different days in the week to Blue Note, to the same high audio engineering standards.The final audio quality can be neary as good as Blue Note and the Abbey plant pressings a match for Plastylite pressings, though Prestige later commissioned from other plants to lower costs. Asked the difference between Prestige and its rival Blue Note, the answer often given was that Blue Note provided two days paid rehearsal. Put in a positive way, Weinstock encouraging performances to be unrehearsed for a more authentic, exciting sound. As a result, some Prestige titles are considered merely extended blowing sessions. Weinstock’s parsimony had other negative effects. If a take didn’t go well, the tape was rewound to the start, with resultant loss of alternate takes. Further,there was an ill-judged move to cheap recycled vinyl in the early Sixties, which left some releases with a permanent background hiss. Nevertheless many early Prestige releases are much sought after, with auction prices to match. 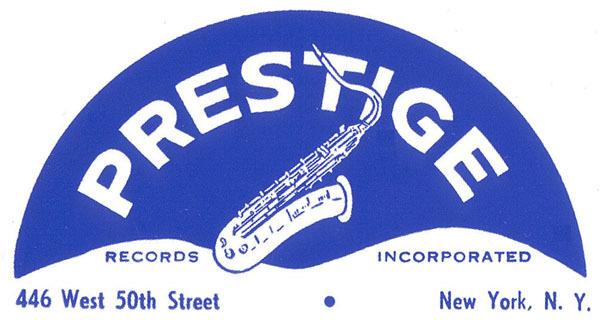 In the early Sixties, Prestige also released records under its New Jazz label.Some, though not all, later Prestige and New Jazz releases were pressed on cheaper recycled vinyl. The impurities in recycled vinyl ( factory detritus, paper label fragments and such) cause a persistent low hiss throughout playback as the stylus interprets microscopic impurities as “information” and is easily noted when it continues in the break between tracks and heard during quieter passages. Some audiophiles find the hiss intrudes into enjoyment of the music and can be quite prominent, depending on the sensitivity of your cartridge and turntable. (On Sixties equipment no-one could tell) Always ask the seller of any late Prestige or New Jazz record you are considering purchase if this applies, as some sellers do not volunteer it or feign ignorance. The central vinyl land has a slightly milky appearance, and the fragments break up normally smooth reflected light. The problem kicks in around 1963-ish, and it is random which records are affected. I have had two copies of the same record, one is hissy, the other not (ironically, the record in question was Roy Haynes “Cracklin’ “) This suggests some batches of vinylite supplied to some pressing plants used by Prestige were adulterated. None to my knowledge originated from Abbey Mfg., but may originate from other plants or unscrupulous suppliers. The practice was not widespread in the industry, as far as I can tell. In the Fifties and early Sixties, Prestige US recordings were released simultaneously in Europe under exclusive national licensing agreements – Esquire for the UK (later replaced by Nat Joseph’s Transatlantic) , SABA for Germany, Barclay for France, Metronome for Sweden & Denmark, Artone for Holland, and Music Depositato for Italy. These national versions were often pressed with supplied stampers from original Van Gelder masters, in only limited quantities, and the quality of pressings are said by some to be superior to the US originals. The UK Esquire releases are of note for their mostly dreadful alternative covers. Most of the European versions are found only in their own localities, with corresponding scarcity of imported US copies. Thanks so much for the info. Now I am looking many of my records in a new way. Here is an interesting one. Red Garland with Curtis Fuller NJ8277. Front cover says New Jazz with black trident. Back cover says Status. Label though is the dark blue NJ with silver Trident. To right. Crazy Hugh. Also my Status album Curtis Fuller and Hamton Hawes with French horns. Feels like 180-200 gram vinyl. And sounds superb. I though it was a premium pressing not budget. I wouldn’t be so harsh on the Fantasy “Berkley, Tenth and Parker” OJC pressings. Those are cut using the original mastertapes and pressed better quality vinyl than what Prestige used in the 60’s. None of the OJC LP’s were cut from digital until the late 80’s-early 90’s. It was easier for them to cut from the analog tape, that’s what Fantasy’s cutting room was set up to do back then. The original Prestige LP’s were cut with compression and filtering at 10k and 60 cycles. Also a midrange boost at 5k. Look at the OJCs as a quality analog reissue. Hi and welcome, Michael.. I have just two OJC editions, and I just returned from revisiting them to check my judgement. I know nothing about the engineers intentions, which I am sure was to produce as good a product as they could. My listening experience? Flabby bass, overall lack of dynamic range, missing any top-end presence, both around 100 gm vinyl, both among the least exciting pressings I have heard, neither comes within an inch of original Prestige. I am not an engineer, I know nothing about filters or technicalities. I try to be fair, I have nothing to gain from any opinion and I openly admit to being wrong sometimes, but I have to stand by my judgement that Fantasy OJC are, well, a poor audio product when compared with original Prestige pressings.